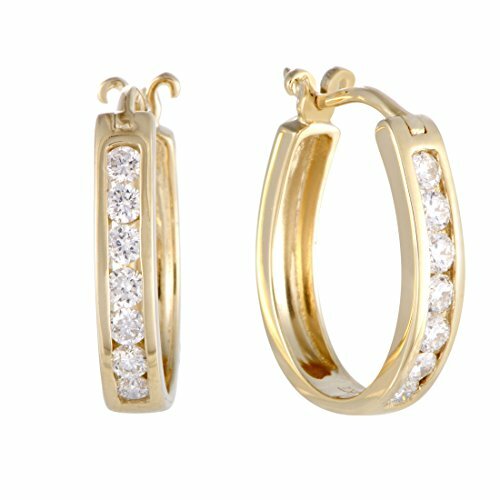 Made from the classy combination of 14K yellow gold and diamonds, these gorgeous hoop earrings offer an incredibly tasteful, refined appearance. The pair weighs 3.2 grams and is set with a total of 0.50 carats of diamonds. Crafted in 14K yellow gold with 0.50 carats of charming diamonds. 0.50 carats total weight of charming diamonds stones used in these gorgeous hoop earrings. Earring dimensions are .75" x .75"
These earrings boast an exceptionally luxurious appeal! A great value all around.